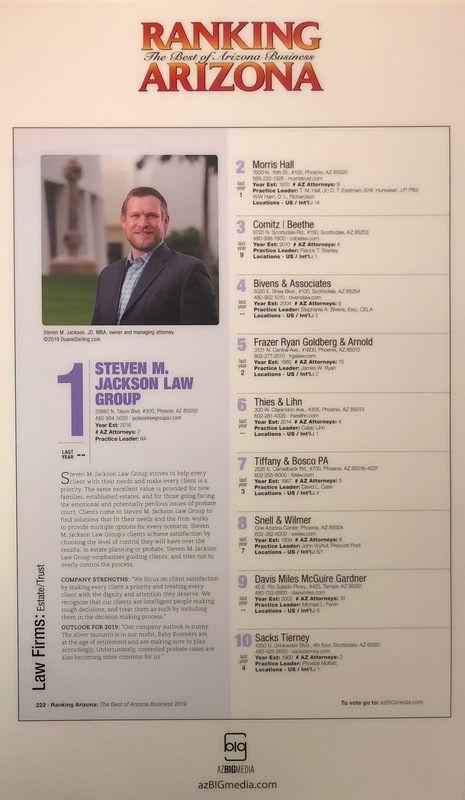 Rankings Arizona recently named Steven M. Jackson Law Group, LLC the top ranked Estate/Trust Law Firm in their Best of Arizona Business 2019. This is the first time Steven M. Jackson Law Group, LLC has been named in Rankings Arizona. We’d like to thank each and every client for your support! In celebration of our being named as the top Estate/Trust Law Firm by Rankings Arizona, we’ll be giving away tickets to this year’s Diamondbacks by random drawing to our clients. If you’d like to be considered, send an email to info@jacksonlawgroupaz.com with your favorite team.